We provide Native and Cross-platform HTML5 App development services for all major smart devices. It is quite clear that Mobile is the way things are going. We understand that there is confusion with what constitutes a mobile app. A mobile optimised version of website or html5 based web application is also sometimes called an ‘app’ . Also there is a big cost and time difference between HTML5 and native app development. We will look at your needs and advice which option would be best suited for you. 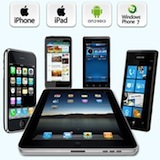 Native App Development : Using Proprietary SDK’s like IOS, Android, Windows SDK. Cross Platform Web App : Using HTML5 which works on all major devices that provide a web browser. Hybrid : We use Phonegap and HTML5 to build cross platform app that still behave like native apps and can be made available via the various app stores. We have considerable experience building mobile apps and guarantee a high quality and cost effective development service.